Halloween 1979. I am 10-years-old. And too sick to go trick-or-treating. My mother cannot bear to tell me it is pneumonia, not ammonia that has me walking to the bathroom on tiptoes, holding my head, because full steps hurt too much. This is not the first time. For three years in a row I have been diagnosed with either pneumonia, bronchitis or both. Always at this time of year – the season of ghosts and goblins, copious amounts of candy, the addition of one hour, and my birthday. Seems I have outgrown my respiratory weariness. I am walking up the stairs of the metro station at Puerta Del Toledo. My head is spinning. My eyes are dry. My throat, itchy and sore. I felt this coming on at lunch yesterday but had hoped to ward it off by jumping into bed early that night. I have already been sick twice this season. But this time is different. I feel it in my lungs. They are heavy. It is as if I can feel each alveola filling with air. I walk to my student’s home, trying to will the illness away. By 1 p.m. I am canceling my Spanish lesson and sending texts in hopes of finding others to take on my evening responsibilities. A friend of mine, a native Madrileno, offers to make an appointment for me. “Does the doctor speak English?” I ask. A little more than 12 hours later, I text her. “Call me if you need help,” she writes. Somehow I have gotten it in my head that she is meeting me here, but clearly I am confused. She is at work and I am fuzzy and unclear about pretty much everything. I check in, more or less without incident. And at 9:30, the doctor herself calls me into the exam room. “Habla Ingles?” I ask, crossing both fingers and toes. “Lo siento. Lo siento. (I’m sorry. I’m sorry. ),” I squeak. I am sick. I am overwhelmed. I am scared. I am 10-years-old, holding my head and walking on my toes, missing Halloween. And yet clearly I am not. 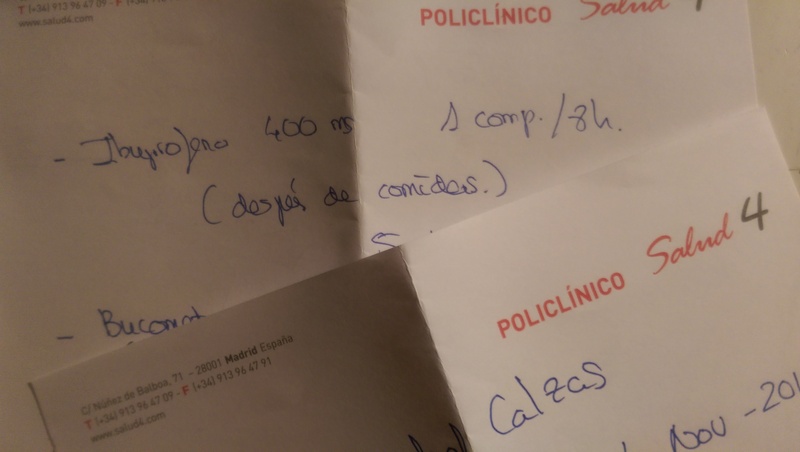 I am 47 and in Madrid, typing back and forth with the doctor using Google Translate – telling her about my symptoms and my medical history. She takes my temperature. She listens to my lungs. She checks my oxygen levels. No fever. My lungs are clear. But she wants to run a blood test to find out why I keep getting sick. I do not understand what she is saying, even with the translator. Probably because this idea is foreign to me. I remember being in the emergency room in Chicago. Once a heart attack was ruled out, they sent me home. The doctor calls my friend the Madrileno, who translates. I get a prescription for ibuprofen and lozenges, as well as for blood work. The doctor schedules an appointment for a follow-up visit – with her English-speaking colleague. I look at my watch. I have been in her office for an hour. A line of patients sit waiting in red chairs in the hallway. “Good,” she says. She tells me that I have done a brave and scary thing — navigating the healthcare system of a foreign country in a language that I don’t quite know. “Guess you can handle more than you think,” she says. Guess I am not 10-years-old.